I probably tasted my first Hainanese Chicken Rice at Johor Baru’s Chinatown food centre located at Jalan Ungku Puan, when the adjacent Segget River was still a stinking open sewer. My visits to this food centre were memorable because when the tide was low, the mouth-watering flavours of freshly cooked food had to compete with the over-powering pong from the river. Even with this river’s dubious reputation, food enthusiasts knew that Chinatown offered some of the best Chinese food in Johor Baru at that time. I remember how the feisty but friendly hawker lady would serve this fluffy, fragrant long-grained rice by packing it tightly into a rice-bowl before cupping it onto a plate. This created a neat little mound of rice which I enjoyed eating meticulously through, while trying impossibly to retain its shape. I can still recall how this flavoured rice, tinged a pale shade of yellow tasted so good that it could even be eaten on its own. After Chinatown was demolished, the hawkers moved to other locations in the city or retired if there was no family member to take over their business. As food centers flourished in modern malls and new residential areas, a variety of Chinese street food including the ubiquitous chicken rice is found in almost every food court now. Recently it became trendy to serve a menu of halal street food from decorated hawker-like stalls with live cooking stations in buffets for private parties and in posh hotels. This is an excellent way to promote local street food to hotel guests and tourists so that they can take home fond memories of some of our interesting local flavours. The hotel too can earn the prestigious reputation for being the destination for an authentic taste of a local favourite like chicken rice. For this reason alone, it’s essential for hotel kitchens to serve consistently good local fare so that guests who had that wonderful experience would bring along their guests to enjoy a local meal in a comfortable place. 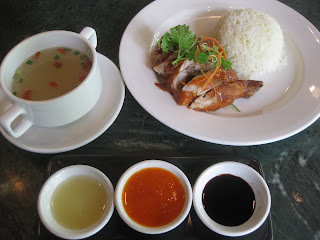 In my quest for good chicken rice, I set out to taste chicken rice in various places in Johor Baru over the last few months and discovered interesting and different ways it is being served. Of course, the standard serving included the flavoured rice with a choice of boiled or roasted chicken chopped in pieces, served with a few slices of raw cucumber and a side of chicken soup. This meal comes with several dips like the mandatory chilli-garlic sauce and ground ginger sauce. Light soy sauce is usually available but thick, dark soy sauce is commonly served here while oyster sauce mixed with garlic may be offered in better restaurants. 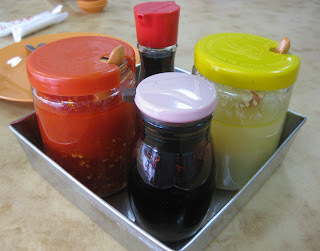 Chicken rice lovers will agree that the right chilli sauce made all the difference in the meal. My friend Margaret, a self-confessed chilli freak, said that the only way to enjoy chicken rice is to heap on the chilli-garlic sauce. As we talked about her passion for this chilli sauce, she shamelessly confessed to often helping herself so liberally from the chilli dispenser that the stallholder had to gently remove it from the table before she finished it. 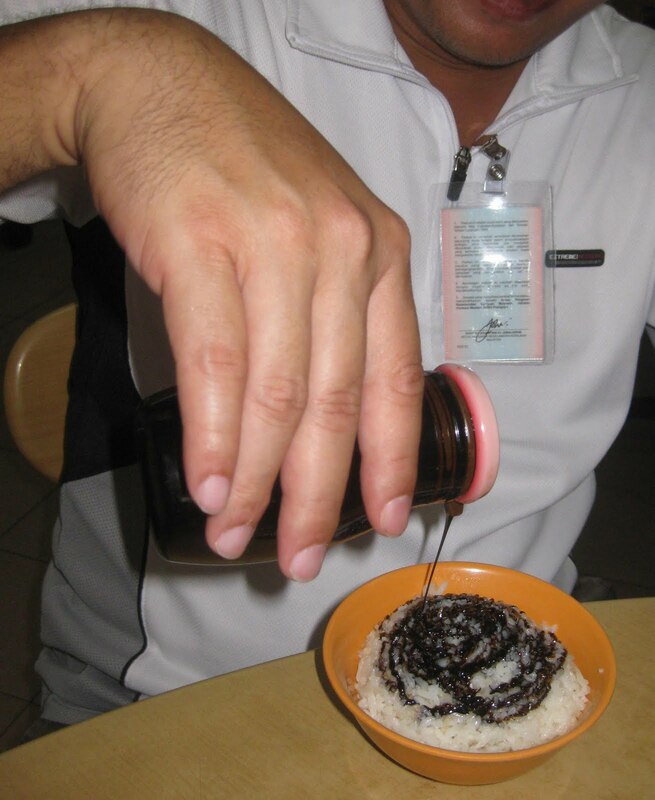 At a chicken rice lunch with my friends, I watched in fascination as William and Shane, one after the other, picked up the dark soy sauce bottle to drizzle it copiously on their bowls of steaming hot rice. They insisted that this is the best way to appreciate the full flavour of the chicken rice meal. The dark soy sauce was such a perfect complement that it brought back childhood memories of how my grandma taught us to mix dark soy sauce with hot rice steamed with Chinese sausages for a tasty Chinese New Year meal. At a recent resort hotel stay, I discovered that chicken rice is an item in their lunch buffet so I requested to have it the next day. My hosts were puzzled that I picked common chicken rice as opposed to something more exotic from their wide menu but they did not know that I wanted to see if they were serving an authentic version of it. When it was served, I was not disappointed because their delicious chicken rice came with a side of soup and three varieties of sauces – chilli-garlic, minced ginger and dark soy sauce. 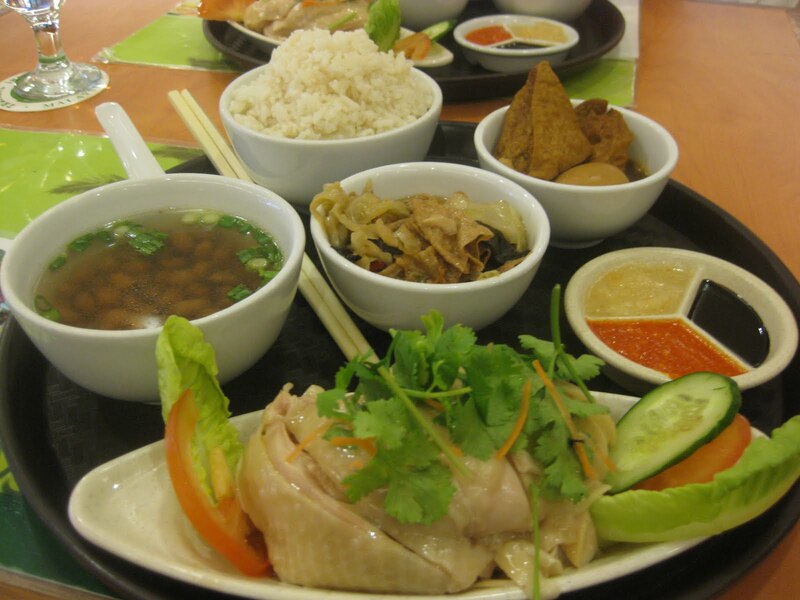 One of the best hotel versions of chicken rice in Johor Baru must be the Hainanese Chicken Rice set served at Café Downtown in Tropical Inn. Fans of chicken rice will agree that the taste of their fluffy rice and smooth chicken remains consistent even while their set serving is enhanced by additional side dishes for a more balanced meal. I was delighted to see the three sauces – chilli-garlic, minced ginger and dark soy sauce – neatly served on a single plate divided into three segments. 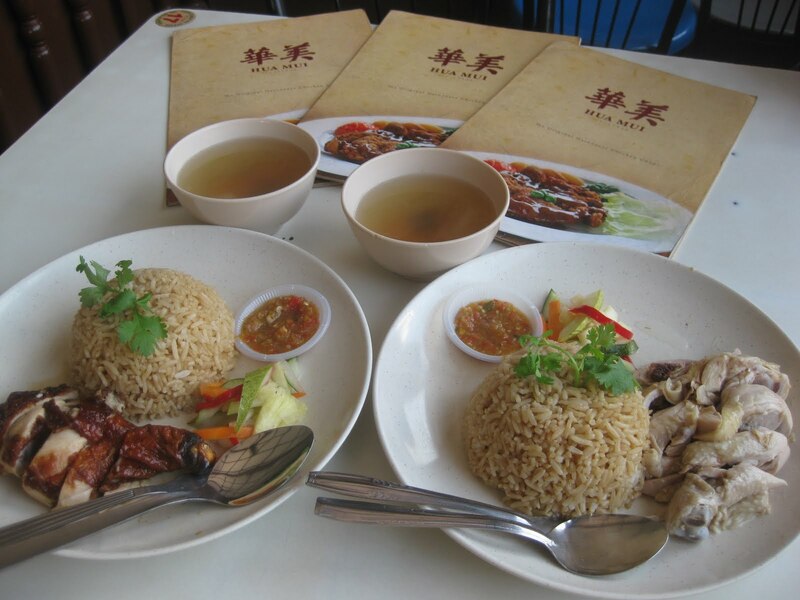 Chicken rice remains a favourite comfort food as it’s mild enough for young and old, and foreigners unfamiliar with spicy chilli flavours can just refrain from adding the chilli sauce. Its available daily from many stalls throughout the city and Hua Mui Restaurant regulars know that it’s chicken rice day on Wednesday. But here’s a friendly word of advice on behalf of my dentist friends to chicken rice lovers, to never eat chicken rice with lots of chilli-garlic sauce before going for dental appointments because dentists certainly deserve a more conducive working environment. My best memories of Johor Baru must be the carefree growing up days at Kampong Wadi Hana. Located between Jalan Sekolah Arab and Jalan Mohd Taib, my friends and I dubbed our kampong “the Bermuda Triangle” because we knew how to disappear into the network of side roads and back lanes in this area. I loved its central location, a comfortable walking distance to town, Jalan Tebrau and Jalan Ngee Heng. Wadi Hana was a multi-racial neighbourhood where boys, many older or younger to me, would play football together in a nearby field. Another of our favourite past-times was playing chatek, a toy made with a few chicken feathers stuck on a small rubber disc, and challenging each other to kick and keep it bouncing in the air for the longest time. My friends and I shared a special bond in a unique friendship because it crossed all cultural and racial barriers. I remember wearing my pair of Bata Badminton Master rubber-shoes, whitened by Penguin brand chalk whitener and walking along the railway track and then across to Jalan Ngee Heng to go to St Joseph School. At that time, I had a pint-size physique and that was why I was always in the front row at assembly and which earned me the endearing nickname, Ravi Tikus, meaning Ravi the rat. I was so tiny that when one of the louvers was removed, I could easily slip through the window. I was exposed to music and dance at an early age because my father used to play the tabla and was a member of the Johor Indian Band with a group of friends. After joining the first kolattam group in Johor Baru, I used to perform with the group at festivals and special events. (Kolattam is an Indian folk dance from Tamil Nadu performed with sticks.) I was introduced to singing with a “live” band when I was just 9 and I will never forget that experience when I went on stage to sing, Dum Maro Dum, a Hindi song from the movie Hare Rama Hare Krishna. Singing became my hobby and I used to dream about singing with a band. 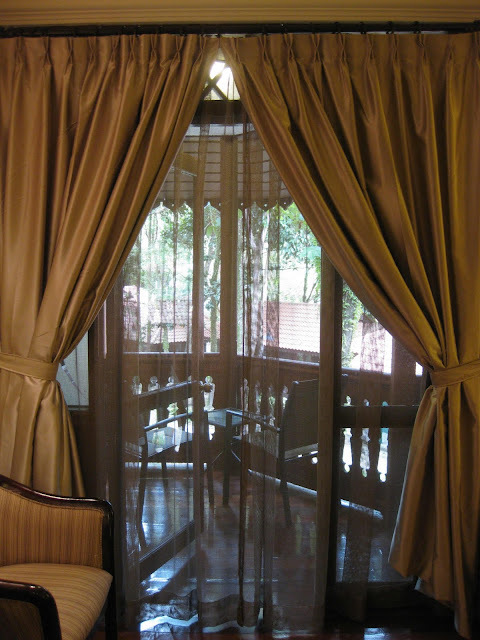 At 16, I would sneak out from home, using the removal-of-window-louver method, to go to hear “The Revolvers” and “The Explorers” perform at Café De Paris at Komplex Tun Abdul Razak. Another unforgettable experience was when I was invited to jam with “The Blues Gang” when they were performing at the Crocodile Pub in Taman Sri Tebrau. 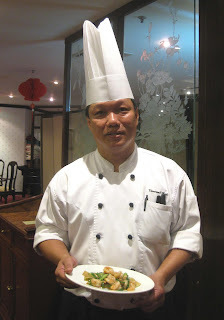 While waiting for my Form 5 results, I joined the Holiday Inn Johor Baru as a Steward and within 4 months, I was transferred to the kitchen as Kitchen Helper to assist Chef Ernest Storkel, an Austrian. He appreciated that I could communicate effectively in English and taught me a great deal in the kitchen. Although I did quite well in my SPM, I decided not to further my studies but continued working and in 7 years, with much hard work and a right attitude, I was promoted to Chef De Partie. 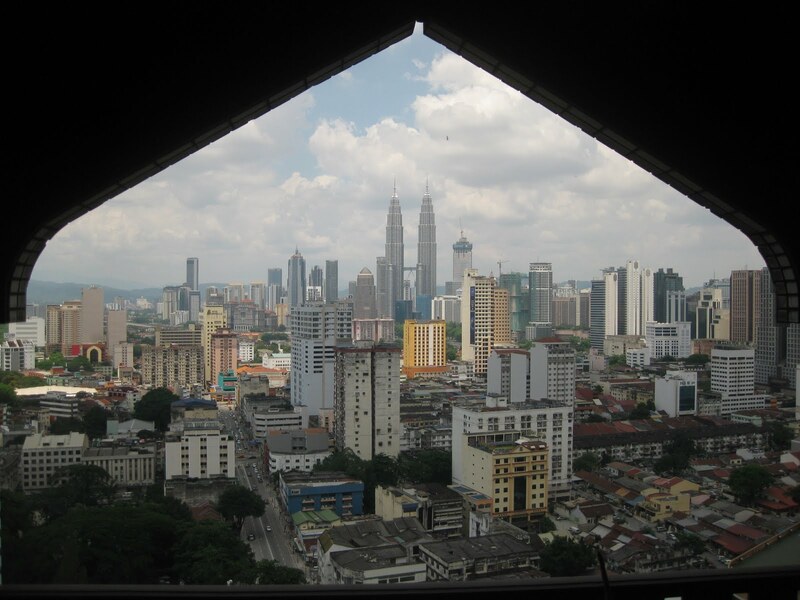 In 1989 I had ideas to find better job prospects in Kuala Lumpur but for a change, I went to work with my friend Derrick Lazaroo in the kitchen of Le Cocktail Café. After 2 years, I was ready to return to the hotel industry and joined the Pan Pacific Hotel Johor Baru as Demi Chef before I was promoted to Chef De Partie again. After 4 years, I decided to work outside of Johor and I joined The Excelsior in Ipoh but in 4 months, I heard that a former colleague from the Holiday Inn Johor Baru was looking for those he used to work with to join his team at Sofitel Palm Resort in Senai. So in 1994, I joined Sofitel Palm Resort as Chef De Partie and moved up the ranks to be Junior Sou Chef and then Executive Sou Chef before becoming Senior Executive Chef. I attribute what I am today to Chef Murray Patterson, an Australian, who told me, “My job here is to make you what I am,” and he taught everything I needed to know in kitchen management and cooking. Even though the hotel changed names twice over the last 17 years, regulars who enjoy my food just keep coming back for more. I’m aware that people have a choice as to where or what they want to eat, so I work extra hard to make them prefer what I create. 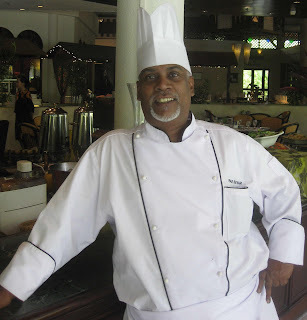 I remember another mentor, head waiter Anasdas Ariokiasamy or Das in short, who taught me that not only front-liners but all staff should have good relationship and communication with guests. Many long-stay guests in the hotel may have memorized our menu by now, so it gives me great pleasure to meet their tastes and create new dishes for them, every now and then. 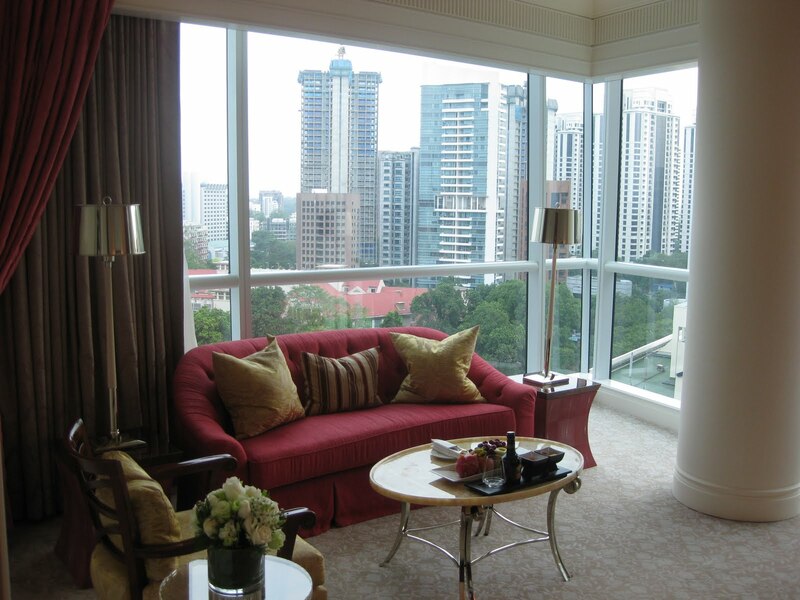 Now it is my privilege to mentor a younger team of associates in the seven kitchens that I manage in the hotel. I may look serious and am very serious in my work but I like to surprise the youngsters by breaking into a song they recognize during tense moments in the kitchen. If I sing while I’m cooking, it quickly breaks any tension within the team and keeps everyone working hard together to make any large banquet a roaring success. 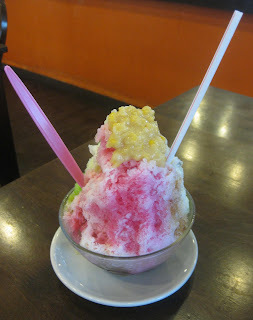 My earliest experience of ice kacang was not from a bowl or on a plate but in the form of an ice-ball held in my hands with a double ply of newspaper. This was the takeaway version of our favourite thirst quencher bought from stalls set up in front of two provision shops located adjacent to my Ah Kong or grandfather’s house at Jalan Ngee Heng. These stalls were the busiest on sunny days, especially before and after school hours when students stopped by to get ice-balls to slurp thirstily as they walked to school or made their way slowly home. A picture of this was brought vividly to mind when I met a former St Joseph student last week who reminisced with me about his experience of walking to school from his home in Kampong Wadi Hana. It was a pleasant surprise to discover that he used to buy ice-balls from the stall next to my Ah Kong’s house and we agreed that it’s truly the perfect treat in our tropical heat. Like many students passing that way, he had a regular habit of getting an ice-ball on his way to school or before walking home along the railway line. For a mere RM0.05 sen, the stallholder would pack shaved ice into a small bowl and add a dollop of sweetened, boiled red beans into its center before heaping on more shaved ice. I used to watch, fascinated at how he would swiftly mould the fast-melting shaved ice into a ball and swish it smoothly around in the bowl to firm up its shape. 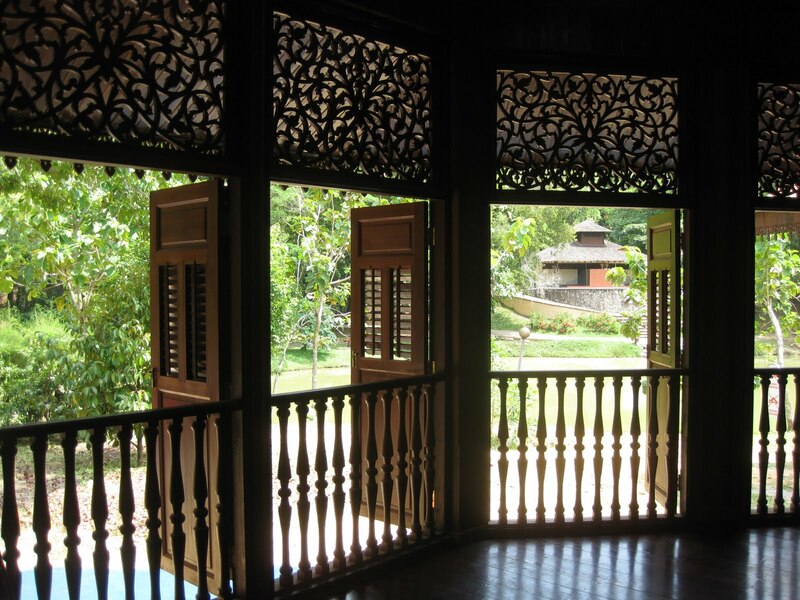 Then he would flavour it with scoops of red syrup and palm sugar, making sure that it was evenly spread all round before topping off the two-tone colour with swirls of evaporated milk. Before the ice-ball melted further, he would swiftly pull two sheets of square-cut newsprint paper from a convenient hook and slap it on the ice-ball for takeaways. At that time, no-one worried if the print ink may be toxic or if it was unhygienic to make the ice-ball with bare hands and to eat off wet newspapers. 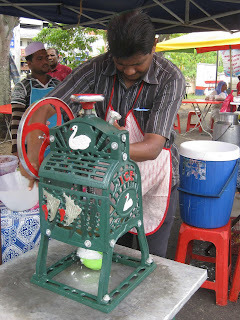 We just loved the way the ice-ball fitted nicely into the palms of our hands and how refreshing it tasted on a hot day. Ah Kong used to keep a little cup filled with small change and often gave the children staying with our grandparents at Jalan Ngee Heng, RM0.05 or RM0.10 sen each to buy a treat from the neighbouring provision shops. There was a range of pickled plums and sour olives, sweets and candy bars to choose from but very often, my choice was an ice-ball. I can still remember the pleasure of eating my way through the ice-ball and how I never mastered the skill to keep it from falling apart. One hot day my brother, cousins and I bought ice-balls and ate them in the front porch as usual, just in case any dripping may wet the floor. For a while we were feeding furiously on the syrupy ice and I cannot forget the shock we had when our cousin Catherine lifted her face from slurping the ice-ball and we saw how her lips had swollen to twice its size. She was stunned because her frozen lips not only felt numb but looked thick and rubbery, and it was some hours before they thawed out and returned to normal. This alarming incident did not stop us from enjoying ice-balls again but we were careful not to keep our sensitive lips against the ice for long periods of time. Since the stall also served this treat on small enamel plates, we started buying our ice kacang heaped on plates. But after we took them home to eat, it was a chore to return the plates later. I don’t know who started it but it was an ingenious idea to bring our own plate to the stall for our ice kacang takeaway. The stall’s plate was only the size of a saucer but when we brought our own, we picked a dinner plate – more than twice that size. I guess it was just his goodwill because the friendly stallholder used to scoop a generous portion of red beans into the centre of the plate before heaping on a mountain of shaved ice and flavouring it thoroughly, all for just 5 sen.
On quiet afternoons when grandma was usually not in her kitchen, we would go to the refrigerator and help ourselves to her jug of Ideal evaporated milk. Even though the ice kacang was already drizzled with evaporated milk, there was no harm in topping it up with an extra trickle. Then we would enjoy every ice-y spoonful to the very last drop. Mega bowl hotel version of ice kacang! Ice kacang certainly hits the spot on a hot and humid day and wherever I am, if it was on the menu, I will not hesitate to indulge in this thirst quencher. 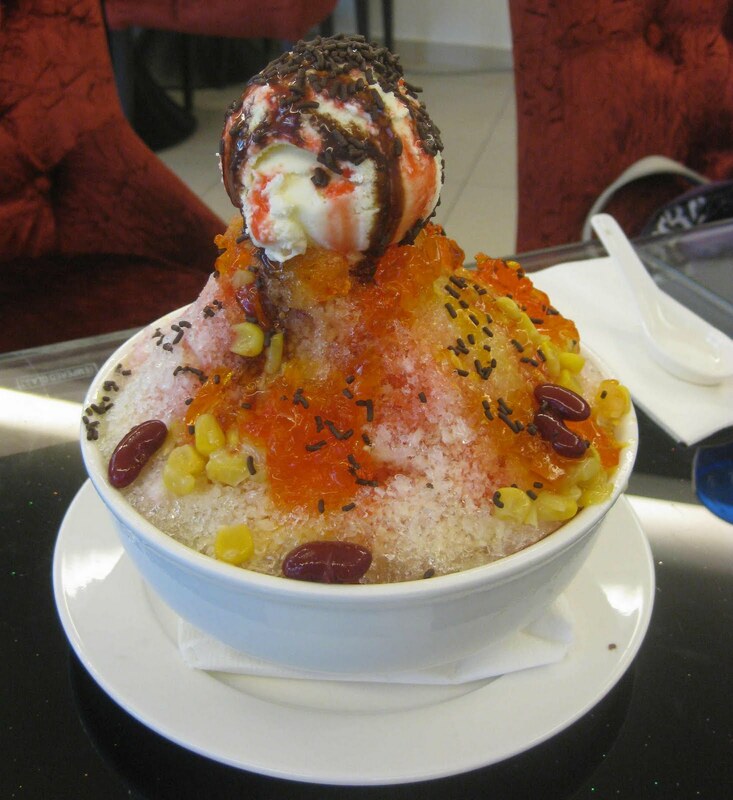 Its amazing how restaurants and cafes try to outdo each other with the wide variety of ingredients in the shaved ice and how high it can be piled or how elaborately it is decorated. In addition to kacang or red beans, there are ingredients like corn kernels, chendol, colourful jelly, chin chau or grass jelly, cocktail fruits and attap chee fruits, and a range of syrup flavours as well as lashings of luxurious chocolate sauce and sprinklings of chopped peanuts, dried fruits and chocolate rice. At a hotel café recently, I was overwhelmed by a mega bowl of ice kacang topped with a scoop of ice-cream in such a huge heap that I had to carefully carve my way through it, lest the whole concoction toppled over. Most sophisticated servings of ice kacang now come with a long handled spoon as well as a straw probably because people can’t eat faster than the rate of melting ice. This popular thirst quencher is now served in posh hotels, resorts, clubs and stalls but to this day, I still cannot find a taste similar to my humble childhood ice kacang and needless to say, never again at the princely price of only 5 sen.
Glad to share some comments received in response to this article. Alicia said: I'm dreaming of ice kacang on a hot day like today! Barney said: I enjoyed your ice kacang story! 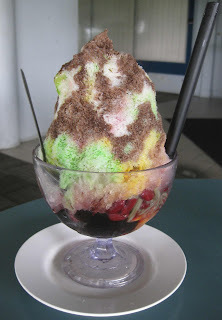 Ka Hwee said: Best ice kacang was at Ee Hng along the seafront. Then there was the round-about place in the bazaar where JB City Square is now. Also love this place we called 'the bird shop' because it used to be a bird shop, behind OCBC Bank. Rose said: Mouth-watering ice kacang is my favourite! 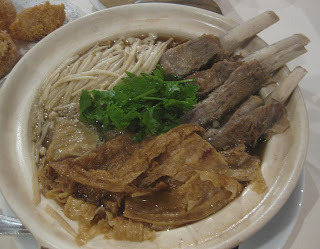 Jin Seng said: It brought back lots of memories of my younger days...when it cost 5 sen only...back then! As Kai Xuan Chinese Restaurant in the Puteri Pacific Hotel Johor Baru has earned a reputation for delectable dim sum, discerning customers are now discovering that there’s also an All-You-Can-Eat buffet menu for lunch and dinner in August. Served in an elegant setting, this buffet menu offers another option for gracious dining, entertaining and the breaking of fast during the Ramadan month. Diners can pick from 70 items on the buffet menu in a selection of appetizers, soup, seafood, poultry, beef, beancurd dishes as well as vegetables, noodles and dessert. Portions are served for a minimum of two guests and orders can be repeated for diners to savour each dish to their satisfaction. The fish choice of Seabass or Red Snapper, served in your pick of preparation, is just nice for a single order. Dishes popular with diners at Kai Xuan include Szechuan Hot and Sour Soup, Deep-fried Prawns with Butter and Fragrant Leaves and Braised Brinjal with Minced Chicken and Salted Fish. Their signature dessert, Chilled Fresh Mango Pudding, continues to a favourite among regulars. Kai Xuan’s Executive Chef – Chinese Cuisine, Vincent Yap Gin Kee, is also recognized as a Red Majesty Chef by Meat & Livestock Australia (MLA) who supports the development of Chinese chefs and their use of Australian beef and lamb in Modern Chinese cuisine. Chef Yap recently created several innovative dishes with Australian beef and lamb where the tantalizing flavours of these tender meats are carefully preserved in traditional Chinese recipes. 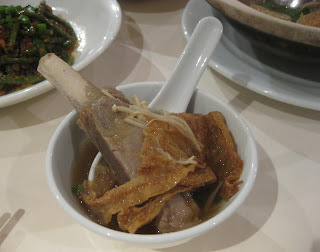 One of these dishes popular with diners at Kai Xuan is the Double-boiled Lamb Flap in Chinese herbs. “It is simmered for up to three and a half hours,” said Chef Yap because the lamb flap, which is essentially a meaty short rib, is so tender that the meat is ready to fall off the bone. Served in a claypot with a generous portion of enoki mushrooms and dried beancurd sheets, its rich broth is deliciously reminiscent of traditional bak-kut-teh flavours. 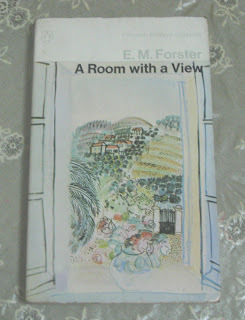 In secondary school, A Room with a View by E. M. Forster was one of the books I studied in English Literature class. It is a 1908 novel set in Italy and England about romance and the repressed culture of English society at the beginning of the 20th century. The heroine is Lucy Honeychurch, a young Englishwoman. I remember those warm afternoons in Literature class, sitting under whirring fans and reading portions of this book aloud, as instructed by the teacher. After each reading, she would take her time to slowly explain portions of the story while I was impatient to see how the story unfolded. I just wanted to race to the end to know if Lucy and George Emerson did, “live happily ever after” and so this was the only text book that I read ahead of the class. When a text book had parts that discussed a kiss in the fields and the heroine’s confused feelings, it was very intriguing to impressionable teenagers. Even at that time, I was surprised that the book was actually part of our school syllabus! So now whenever I come across a room with a view, it holds many fond memories of my upper secondary school years and dear friends in our English Lit classes. 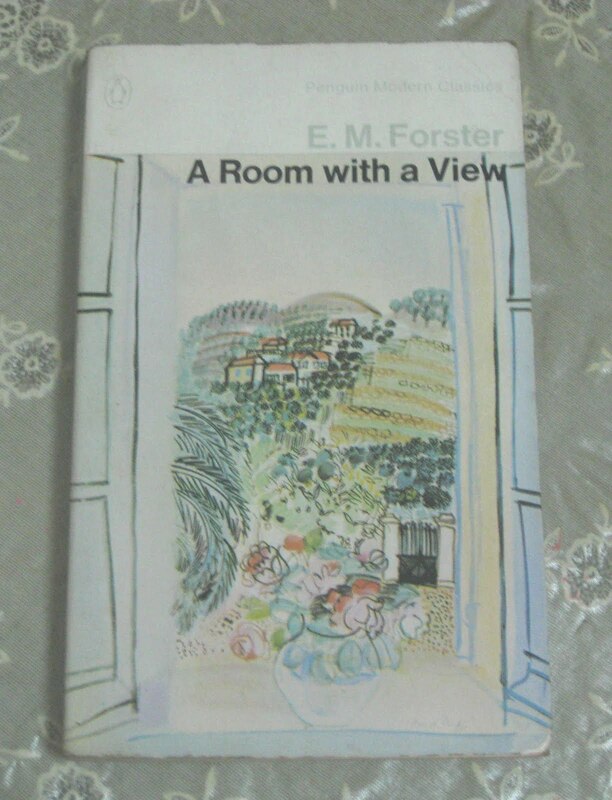 Interestingly, A Room with a View was ranked 78th in the Modern Library list of the 100 best English language novels of the 20th century in 1998. This classic novel was also made into a movie in 1985 and won several Academy and BAFTA awards, and a Golden Globe among many other accolades. Recently I discovered that in my travels, I had somehow garnered quite a collection of “rooms with a view” over the years and each photo tells its own story. It appears that rooms with a view certainly has a special place in my heart.